Orchid supplies, species and hybrid orchids. Offers a variety of orchid species and hybrids. Features many species and hybrid orchid plants. Printable order form available. Specializing in Phalaenopsis species and hybrids. Site with seedling catalogue and photo gallery of orchid pictures. Specializing in Orchid species and hybrids for the hobbyist of all interest levels. Orchid photographs, cultural information sheets, and supplies also available. Specializes in orchid species, hybrids and Paphiopedilums. Nursery located in Aiea, Hawaii. Retail and wholesale. Orchid taxonomist specializing in Brazilian species presents his books and guides, and descriptions with photos of many species. Also sells orchids and botanical prints. Complete orchid catalog of tissue media, chemical supplies, plant hormones, glassware, laboratory equipment, HEPA filters, supplies, orchids, stem propagations, Mexican and Ecuadorian species, growing instructions, and laboratory procedures. Specializing in rare orchid books, antique orchid prints and back issues of orchid magazines. Brazilian orchid grower offering a variety of species. Venezuelan and Latin American Orchid Species, mainly Cattleyas. Provides a free flasking service for orchid species seed as well as flasks for sale. Laboratories and farms producing orchid species for sale as live plants, exported worldwide. Orchid supplies, species and hybrid orchids. Features catalog, events, and directions. Orchid dealer features hybrids grown in Ireland and includes cultivation and care tips, price list and newsletter subscription. Orchid farm ships mixed tropical bouquets, leis fresh cut orchids and orchid plants. Orchid propagation laboratory and nursery in Colombia, offering several hundred different species and hybrids, with a wide variety of genuses represented. Photo catalog. Specialists in Cattleya and Phalaenopsis Mericlones Orchids. Offers other orchid species and hybrids as well as Paphiopediliums and Phragmipediums. Virginia nursery offering species orchids to customers in the US. Text catalog, photo galleries of orchids and operations, and printable order form. Created and sold to raise awareness in support of endangered species. The store donates at least 10% of all profits to organizations supporting endangered species and their habitats. Mail order site for flowering orchid plants and growing supplies. Offers live orchid plants and arrangements. One of the largest selections of orchids in the world. Orchid gifts shipped in bloom to anywhere in the country. Orchid nursery in Hawaii, offering beginner orchids, a large assortment of Cattleyas, a fragrant collection, and other assorted genera. Online photo catalog. If the business hours of Oak Hill Gardens in may vary on holidays like Valentine’s Day, Washington’s Birthday, St. Patrick’s Day, Easter, Easter eve and Mother’s day. We display standard opening hours and price ranges in our profile site. We recommend to check out oakhillgardens.com/ for further information. 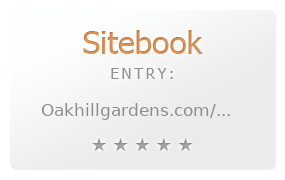 You can also search for Alternatives for oakhillgardens.com/ on our Review Site Sitebook.org All trademarks are the property of their respective owners. If we should delete this entry, please send us a short E-Mail.